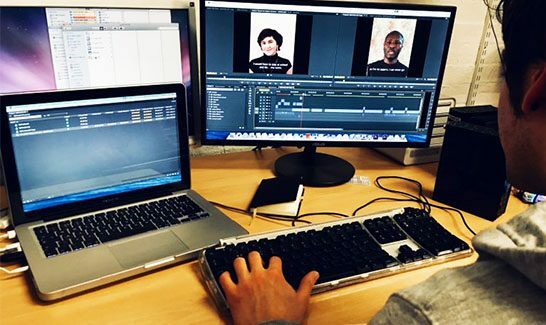 Our Video Editing Workshops offer the opportunity to quickly and affordably acquire comprehensive post-production skills in a small group setting. We teach primarily on Adobe Premiere Pro. We can also arrange one-to-one training - suitable for individuals, pairs or threes - and schedule bespoke courses for groups of four or more. One-to-one and bespoke group training can be tailored to meet your requirements - that means we will teach on editing software of your choice, and we can work on your actual video project. We cover both how to use the editing software - from importing, marking, logging and editing, to adding soundtracks and effects - and workflow techniques: essentially, showing you an easy and stress-free way to turn your many hours of unorganised footage into a well-structured final documentary film, short video, or promotional clip. Like our Video Production Weekend course, our editing training is popular with aspiring documentary filmmakers, 'self-shooter' journalists who want to expand their skill set, marketers who want to make and edit their own promotional videos, and hobbyists who want to produce better results. We particularly recommend the course to individuals who have completed one of our video production courses and want to add editing skills to their repertoire. Video Editing Workshops are suitable for complete beginners and people with basic skills, from any background. One-to-one training and Bespoke courses can be arranged to suit participants at any experience level. There will be between 3 and 8 participants on each workshop. One-to-one tuition - contrary to the name - is available for one to three people. Bespoke group courses can be arranged for 4 to 20 participants. We don't currently have any dates scheduled but we may be able to arrange additional dates if we receive sufficient interest. Or email us to discuss one-to-one training options. For one-to-one and bespoke prices, please follow the links or email training@spectacle.co.uk to enquire.